An enormous, 141-acre water park, Aquaventure at Atlantis Casino and Resort offers a highly themed Mayan atmosphere, lush landscaping, unique water rides and attractions, and opportunities to interact with animals. While the ingenious "transpotainment" system that connects all of the Power Tower attractions doesn't eliminate lines, it allows guests to remain in their inner tubes and immersed in the water while they float from one ride to the next. "Water escalators" even convey riders up to the tops of the tube slides. The mile-long Current ride, which incorporates four-foot waves for a more-than-lazy river experience, also floats through a tropical jungle and caves. Other attractions include the Leap of Faith speed slide and the Serpent slides. 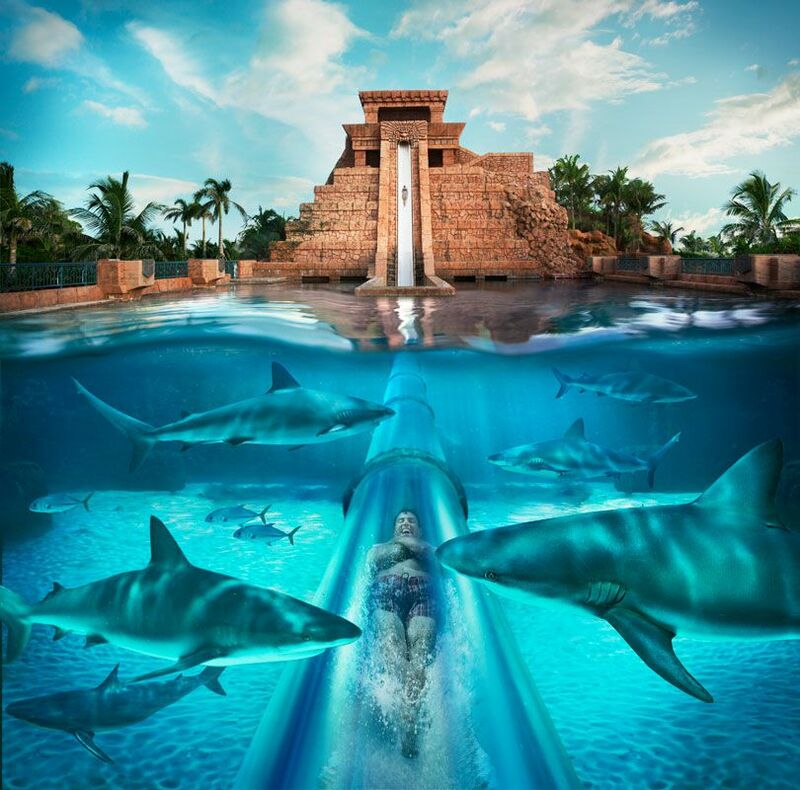 These body slides are built into the side of a Mayan temple and send riders zooming under the water in clear tunnels where they float past sharks. Note that the Power Tower and Mayan Temple slides have 48-inch height requirements. There are children's pools for younger guests. Atlantis also offers Splashers, a children's interactive water play structure with smaller slides, soaking devices, and a dump bucket. In addition to the water park attractions, the park offers 11 pools, including a lap pool and three pools designed for kids. The park is located adjacent to three beaches. Private cabanas are available for rent. For an additional fee, Aquaventure also offers a rock climbing attraction. Adjacent to the water park is Dolphin Cay, a marine animal habitat that offers swimming with dolphins, interactions with sea lions, paddleboarding, snorkeling, and other activities. Each of the experiences requires a separate fee. Reservations are recommended. Aquaventure and all water park attractions are available for registered guests of Atlantis and are included in the rates. All-inclusive packages bundle hotel accommodations, activities such as the water park, marine exhibits, and first-run movies, dining at select restaurants, and drinks at select bars and lounges. Guests of the adjacent Comfort Inn may also visit Aquaventure. The park offers day passes to the general public, based on availability. Because Aquaventure is part of the Atlantis resort, there is an incredible array of dining options. With 21 restaurants and 19 bars and lounges, there is something for every taste and budget, including fine dining, casual dining, buffets, and quick-service eateries. Atlantis offers a variety of hotel accommodations including the upscale The Royal, the moderately priced The Beach, and studio suites at The Reef. Note that all travelers to and from the Caribbean, including U.S. citizens, must have a passport to enter the country and to re-enter the United States.